If you're on the hunt for a recipe that's healthy yet flavorful for busy weeknights, look no further. Fish is one of the fastest-cooking proteins and doesn't require hours of marinating, meaning it's perfect for those nights when you need to get dinner on the table in a hurry. In this recipe, salmon fillets are glazed with a sweet-savory mixture of honey, lemon juice and garlic for a quick and easy main course that the whole family will love. Make your oven do double duty, and roast some vegetables tossed with olive oil, salt and pepper while the salmon is baking. To get a crispier surface on the salmon, sear the fillets in a cast-iron skillet over medium-high heat for couple of minutes. Then transfer to the baking dish and bake until it's cooked to your desired doneness. For extra flavor, sprinkle the salmon with fresh chopped parsley and serve with lemon wedges. Per Serving: 573 calories; 28g fat; 28.4g carbohydrates; 51g protein; 143mg cholesterol; 147mg sodium. Yes! This recipe couldn't be any simpler and I love it. It's one of husband's favorites now. I like to put extra ginger on my portion. 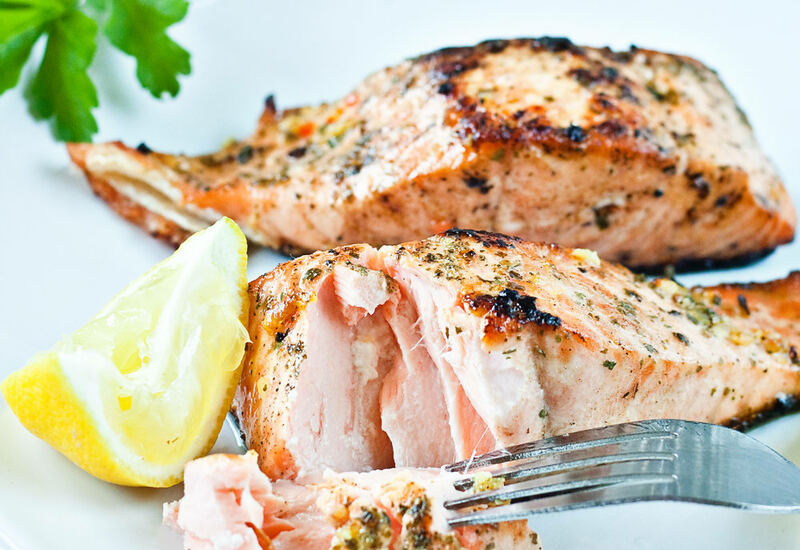 Very delicious salmon, perfect for the oven or the grill. I would not normally use honey and ginger, so this was a nice switch. Really enjoyed this salmon. Served with a side of roasted veggies I cooked at the same time. I want to make this again using a different fish, maybe sea bass.